I have finished the ducks. I named it "FAMILY OUTING" ON ST GEORGE ST. I actually took a picture of this mother Mallard and her three babies on St. George St. one day. She drew quite a crowd, especially when one of her babies strayed into the street! She stopped all traffic both car and pedestrian when she ran out after her baby and scolded the little one QUITE LOUDLY all the way back to the sidewalk! Everyone enjoyed watching mama as she then shook her tail and the family unit headed on down the sidewalk together, heads held high! We could all learn a few things from animals. They are good parents and teach valuable life lessons to their young ones. 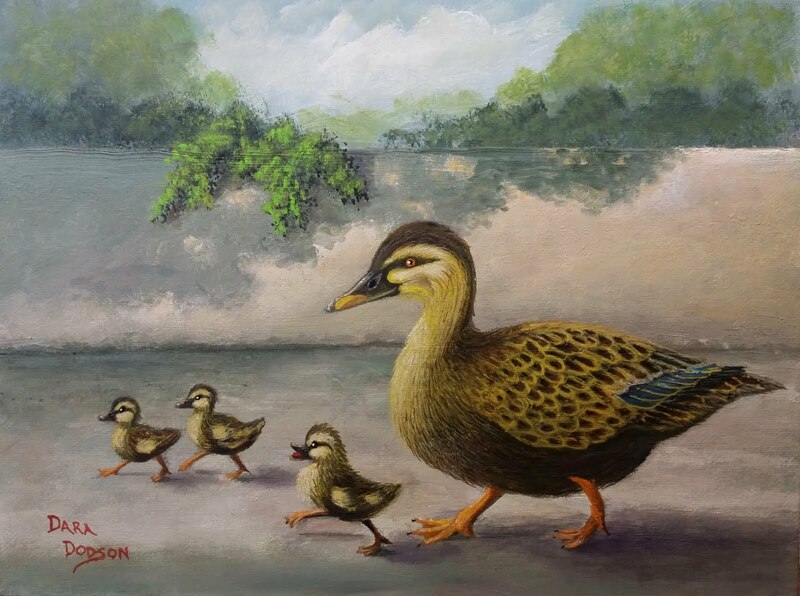 I think it would be reasonable to say that young duck learned something that day and it was easy to see that those babies were having the time of their lives! It was also interesting to note that the other two babies stayed glued to their spot on the sidewalk while mamma went after the stray. Animals definitely have a means of communication and it works well. After snapping a couple pictures, I decided that I definitely wanted to paint their "portrait" soon. The three "progress" pictures are below. Enjoy!! 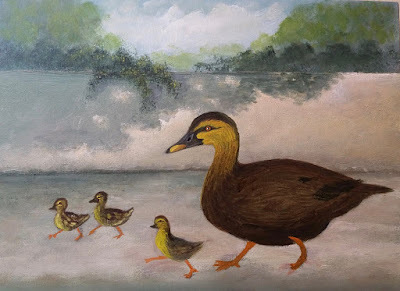 Here, I painted in the base of the ducks and have started the highlighting. To get it right, I googled images of Mallard ducks and selected the photo I wanted to use to get the details correct. The feathers of the babies are completely different from mama and each one was slightly different from the other except for their heads. For some reason, they are very consistent. I also wanted the one baby closest to mom to have an attitude, so I puffed out his chest, made his head a little higher and picked his front foot up higher. Notice the difference especially on the last picture. I also eventually opened his mouth for the final detail. Now, it looks finished and I thought it was. But I let it set for a day and then went back to look at it again. When I did, I compared this with the photo I used for reference. Mama's wing went down too far. So it was back to the brushes. Also, it needed more highlighting in several places. Then looking again, I noticed that mama's legs were too thin and she has a bump at the ankle that I had forgotten to put in, also, her feet were too short. Details are very important to get right. In other words, more work to be done. So be it....especially as I am hoping to take it down Tuesday to the FLORIDA FOREVER show. NOW, I think that I am finally done. You can see a big difference in the highlighting, one the birds, the vine on the wall and even the wall itself. 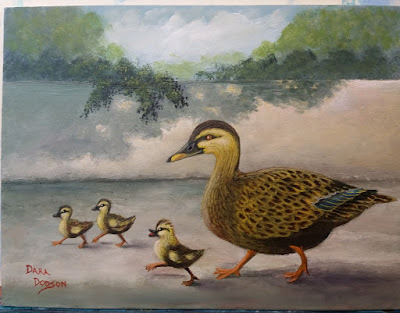 I darkened the shadows under the birds, lengthened mama's feet and added the bump on her ankle as well as toenails. I also needed to add a small dark spot on her cheek. And last, but not least, I raised her wing. Actually, now that I look at it again, it probably could even go a little higher, maybe. BTW, our little baby in front is SO cute, right? He is really strutting his stuff! I have his chest puffed way out, his mouth open, his head high and his front foot is straight out in front! "FAMILY OUTING: On St. George St."